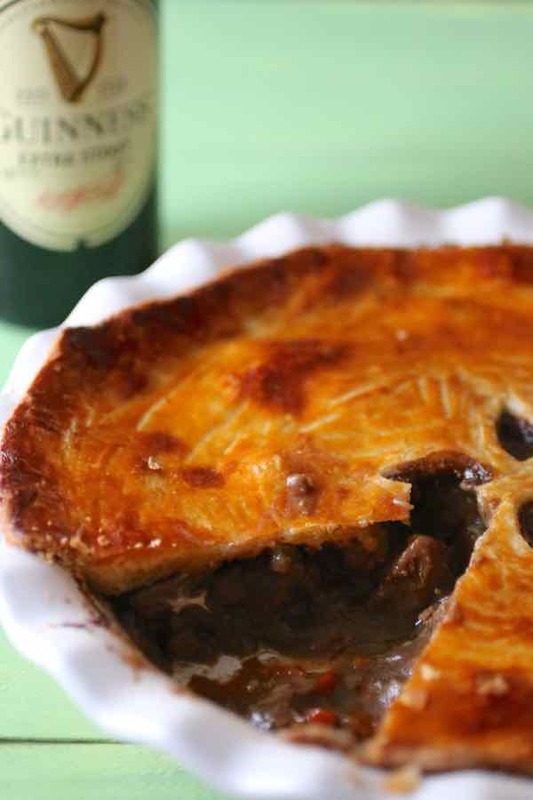 Steak and Guinness pie or Guinness pie in short is a variation of the popular British steak pie. 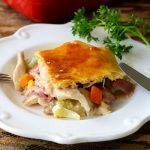 It consists in a casserole of diced beef stewed with other vegetables and topped with pastry. 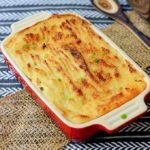 Guinness pie is a classic of Irish cuisine and is usually served with “steak chips” (thickly sliced fried potatoes), or mashed potatoes and peas. Meat pies can be traced back to the Neolithic Period, around 9500 BC. Pies were eventually adopted by the Greeks, and they are the ones who started using a flour and water paste that they filled with meat. Romans continued using the technique of pies with a variety of meats as well as oysters, mussels, and fish as fillings. They also added oil to the flour and water mixture. However, this pastry was not meant to be eaten at the time and was therefore thrown away. 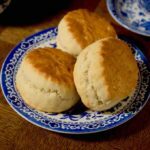 During the Medieval times, Northern European cooks started adding fats like lard and butter to the pastry to make a stiff dough that would hold better. These pastry dishes were called coffins (or coffyns), which meant a basket or a box. They eventually were named pyes or pies. The origin of this name can be traced to the type of meat that was commonly used as filling. Although meats such as beef, lamb, and duck were commonly used, it was most of the time magpie that was the main ingredient. In medieval English, since magpies were originally named pies, the name of these meat pastries stuck. According to the Oxford English Dictionary, the first written record of the word “pie” as food dates from 1303. We owe the flakier and tastier pastry to the French and Italians who used new methods of adding butter, as well as rolling and folding the dough. It was the missionaries and explorers who helped spread the meat-based pies across the globe. 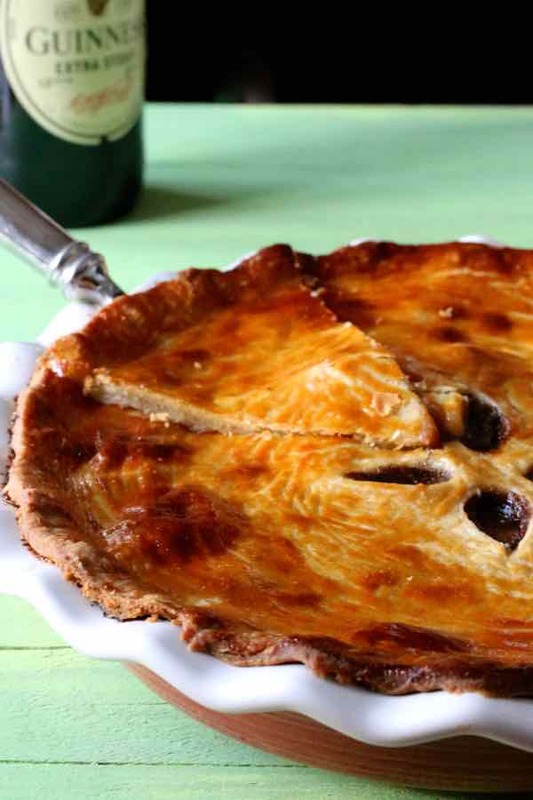 The English Pilgrims brought the recipes for these pies with them to North America. The pastry top was actually used to preserve food during the long winters in America. 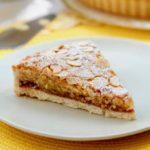 Although sweet pies are now probably more popular than meat-based pies, there are a number of versions of those savory pies around the world. 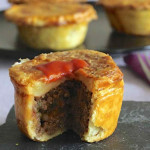 – British meat pies, as well as Australia and New Zealand meat pies. 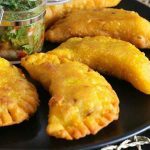 – In the Middle East, meat pies are called sfiha or lahm bi ajin, and they look more like a pizza topped with ground beef and spices. 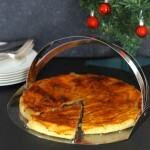 – The Greek call their meat pies kreatopita. They contain ground beef, onions and feta cheese, that is wrapped in phyllo dough. 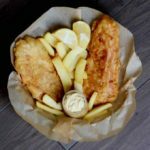 – British pasty is a speciality from Cornwall that is prepared with meat, potatoes and rutabaga. 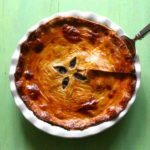 – Although Canadian tourtiere is very similar to a standard meat pie, Canadian flipper pie, another Canadian delicacy is made with seal meat. 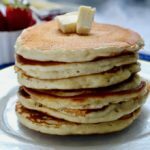 – The Canadian also make cipaille (coming from the old recipe sea-pie, which alternated seafood and meat). However, cipaille only includes different types of meat. – The Finnish have their lihapiirakka, which is filled with ground meat and rice, before being fried. 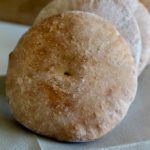 – Scotch pie or mutton pie is a double-crust pie from Scotland, made with ground mutton. – Another British classic is steak and kidney pie. – And Vietnamese love their pâté chaud or bánh pa tê sô, which is typically made with ground pork or chicken wrapped in puff pastry. 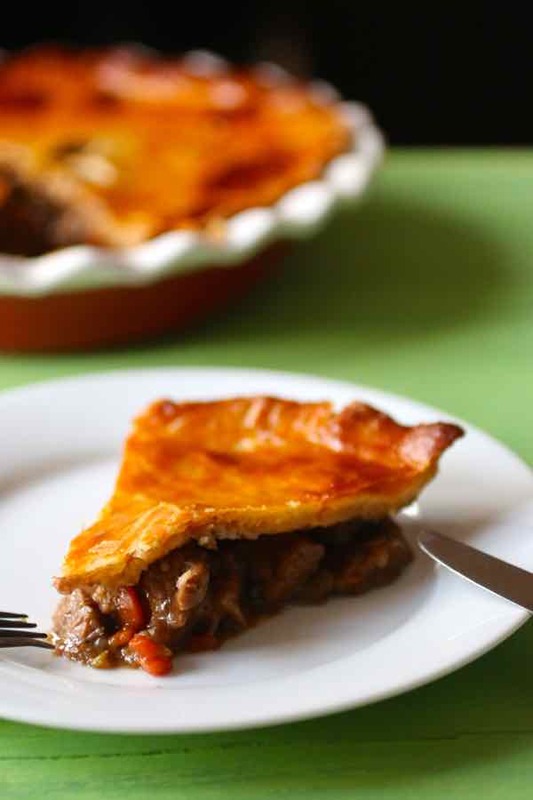 Steak and Guinness pie really starts with a steak and Guinness stew that is sometimes eaten as is, and can also be topped with a pastry to make a Guinness pie. 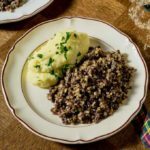 The stout’s slightly bitter and chocolate flavor when cooked with the meat and the other ingredients creates a rich and unique bold taste. Steak and ale pie, a popular dish in British pubs, is a variation of Guinness pie that uses ale in place of the famous stout. 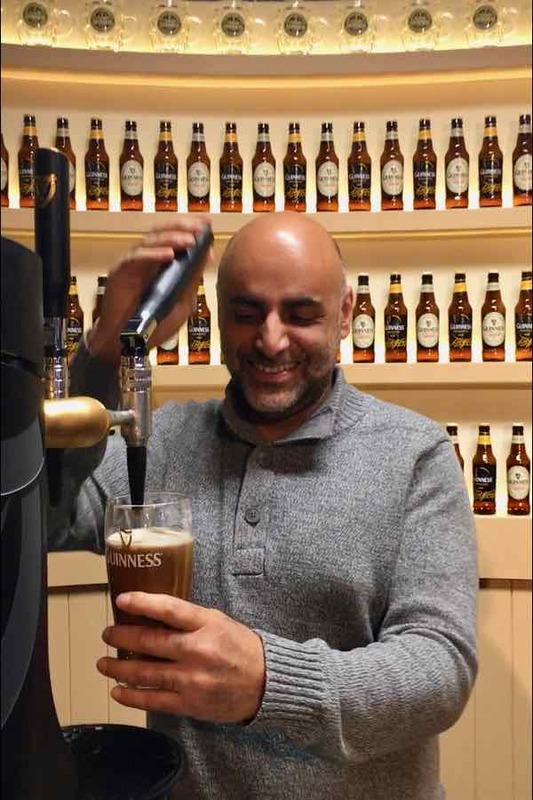 I had the pleasure to visit the Guinness Storehouse when I was visiting Dublin for work in 2016. What a fantastic time learning about the story of this iconic beer and also learning how to pour it, and most importantly to drink it! Guinness is a dry stout was created by Arthur Guinness in the 18th century at St. James’s Gate brewery in Dublin, Ireland. Guinness is one of the most successful brands of beer worldwide. It is now brewed in close to 50 countries and is available in over 120. In 1997, Guinness plc merged with Grand Metropolitan to form the multinational alcoholic drinks producer Diageo. Diageo is now a 15 million GBP revenue company, employing more than 33,000 people. Above all, cooking with alcohol is definitely something we like to do on 196 flavors, whether it is boeuf bourguignon with Burgundy red wine, pasticada with dessert straw wine Prosek, or saganaki flambéed with Brandy. For some reason, I realize that all those recipes are mine. Would I be the only alcoholic here? Obviously, this recipe, like most recipes where alcohol is used is totally safe for children, as the alcohol evaporates with the cooking. I prepared this hearty meat pie for a weekday dinner and everyone absolutely loved it, even though the kids were a little turned off by the beer at first. Well, I will give them a few more years to appreciate beer outside of a cooked dish! Guinness pie is a traditional Irish meat-based pie cooked with Guinness stout beer and served in pubs throughout Ireland. In a large bowl, combine the beef, Guinness, garlic cloves, and bay leaves. Cover and refrigerate overnight or at least 4 hours. Drain the marinade and discard the garlic and bay leaf. In a large pot over medium heat, bring the marinated beef, Guinness, and the beef broth to a boil. Reduce the heat to medium-low and cover. Simmer for 2 hours, or until the meat is tender. Add the celery, carrots, onion, salt, pepper, and bouquet garni and cook uncovered for 20 minutes, or until the vegetables are cooked through. In a small bowl, mix the cornstarch with 4 tablespoons of cold water. Stir into the pot, and cook for 5 minutes or until the sauce is thickened. Combine the flour, salt, shortening, and butter in the bowl of a stand mixer and mix until the mixture resembles coarse crumbs. Add water, ¼ cup at a time until the dough comes together. On a floured surface, roll out the dough to make a shape about the size of your casserole dish or deep-dish pie pan. Remove the bouquet garni, and transfer the filling to the casserole dish. Cover with the pastry, adjust the edges and poke a few holes to allow steam to escape. Brush the pastry with the egg wash.
Bake for 40 minutes, or until the top is light golden brown. 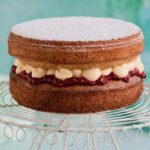 This looks delicious and even though a bit of work looks well worth it. Where can I locate the molds used? Where can I buy the star molds used? Not sure Bobbie. Those were purchased in a store in France. Where do you live?